Luxury Condo- Gulf Front 24th Floor, 2 Bath WiFi HBO 3 Pools Great Amenities. This is one of 570 luxury Condo that's Located in Tidewater Beach Resort open in March 2008. 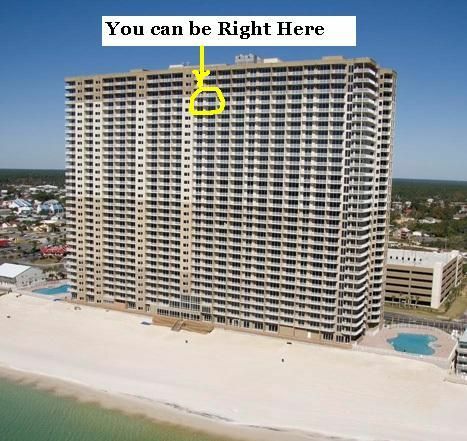 All rooms access to Gulf Beach Front. long, another- 5’4” long. Dining area. bunk bed with a futon on the bottom. cooking Utensils. Including Free HBO,WiFi Internet and Long distance calls USA and Canada. Many shopping centers and restaurants surround the area. Only 500 feet away from the famous Pier Park,1.5 mile from Frank Brown Recreational Complex. Minimum Age Limit for Renters is 25. No college spring breakers, please. We came to Panama City Beach for the first time in early April. This condo was perfect for my husband and I. It had everything we needed. The bed was comfy too! That is very important to us. Thank you Slava for your quick responses to my questions. Had a great time. Condo was nicely decorated and clean. Beautiful view from the 24 th floor! This is our second stay and we love it. We got evacuated because of Hurricane Michael and the condo owner was very understanding and refunded us the remaining nights. We’ll def be back! Very nice! The staff was courteous and helpful. The condo had a spectacular view and relaxing! We loved the condo and took advantage of all the facilities had to offer! The restaurant food was delicious and everyone here was very nice! The owners were prompt to our booking and has kept the condo with all amenities. The bed was very comfortable and we thoroughly enjoyed our stay here! Overall a wonderful stay. The condo was very clean and had a beautiful view. The only downside was the elevators. Many people waited for over an hour for the elevator and I had to climb 24 flights of stairs in order to not stand in line waiting for the elevators. Don't hesitate to rent this unit--it was wonderful! A cool, clean, relaxing retreat! This is our second stay at Tidewater, and our first in this unit. We LOVED it. The view is breathtaking with a double-long balcony smack dab in the middle of the 24th floor. (Close to the elevator, but far enough away and set back far enough that there was no elevator/hallway noise.) The bedroom was my own personal retreat. The master bed/bath is quite large and relaxing—I wanted to live there! The couch/bed options in the living room were great, and the bunk cove was semi private. We loved having 2 bathrooms and a washer/dryer. There were also small extras like DVDs and games. And did I mention THE VIEW!! This unit was clean and in excellent shape. It was not overly cluttered with unnecessary furniture or knick knacks, yet there was PLENTY of seating. We were pleasantly pleased that the floors had been updated to tile throughout the unit. The kitchen was well stocked—there were even plastic tubs that we could use while we were there. There were enough starter items (1 roll of paper towels, 2 rolls of toilet, 2 packs of dish detergent, small bottle of dish soap) that I did not have to go to the store for a couple days had I not needed groceries. You do need to bring your own spices, plastic wrap, foil, etc. But, that’s fairly standard. I visited Tidewater at a less busy time, so no issues with parking or elevators. Next time I visit PCB, I will not hesitate to rent this unit. Great space, great location, great rate, and a responsive owner. Can’t beat that! Located on Mexican Gulf Beach surrounded with shopping centers, restaurants. 0.5 mile to Pier Park, 1.5 mile to Frank Brown Recreational Complex with Lighted Tennis courts, Basketball courts, Baseball field, Childrens play ground and Water park. Other Activities: Jet Skis,Deep Sea Fishing,Kayaking,Banana Boat Rides,Mini Golf,Basketball courts,Baseball field,Children play ground and Water park Recreational Cntr.